mStrawberry OP9 cells allow for complete evaluation of all ES-derived progeny from co-culture. Lynch, M. R., Gasson, J. C., Paz, H. Modified ES / OP9 Co-Culture Protocol Provides Enhanced Characterization of Hematopoietic Progeny. J. Vis. Exp. (52), e2559, doi:10.3791/2559 (2011). The in vitro differentiation of ES cells towards a hematopoietic cell fate is useful when studying cell populations that are difficult to access in vivo and for characterizing the earliest genes involved in hematopoiesis, without having to deal with embryonic lethalities. The ES/OP9 co-culture system was originally designed to produce hematopoietic progeny, without the over production of macrophages, as the OP9 stromal cell line is derived from the calvaria of osteopetrosis mutant mice that lack functional M-CSF. The in vitro ES/OP9 co-culture system can be used in order to recapitulate early hematopoietic development. When cultured on OP9 stromal cells, ES cells differentiate into Flk-1+ hemangioblasts, hematopoietic progenitors, and finally mature, terminally differentiated lineages. The standard ES/OP9 co-culture protocol entails the placement of ES cells onto a confluent layer of OP9 cells; as well as, periodic replating steps in order to remove old, contaminating OP9 cells. Furthermore, current protocols involve evaluating only the hematopoietic cells found in suspension and are not optimized for evaluation of ES-derived progeny at each day of differentiation. However, with replating steps and the harvesting of only suspension cells one potentially misses a large portion of ES-derived progeny and developing hematopoietic cells. This issue becomes important to address when trying to characterize hematopoietic defects associated with knockout ES lines. Here we describe a modified ES/mStrawberry OP9 co-culture, which allows for the elimination of contaminating OP9 cells from downstream assays. This method allows for the complete evaluation of all ES-derived progeny at all days of co-culture, resulting in a hematopoietic differentiation pattern, which more directly corresponds to the hematopoietic differentiation pattern observed within the embryo. In order to maintain mStrawberry OP9 cells, media must be changed every 2 days and cells should be subcultured prior to cells reaching confluency (subculture at 70-90% confluency). mStrawberry OP9 cell cultures are never grown beyond 90 % confluency as this will result in their differentiation into adipocytes. See Figure 3. When the cells have detached, add OP-9 growth medium. Transfer cells to a 50mL conical tube. Pellet cells at 300 x g for 5 minutes at room temperature. Discard supernatant. ALWAYS Subculture OP9 cells on Day -3, so that you have confluent layers of mStrawberry OP9 cells for Day 0 of co-culture. See Figure 4b. Plate mStrawberry OP9 cells at 1x104/cm2 for confluency at Day 0. Be sure to subculture extra cells for Day 5 and Day 8/9 for the continuation of co-culture. Plate 1x103 ES cells/cm2 to flask of mStrawberry OP9 cells. Incubate cells at 37° C, 5% CO2 with humidity. Subculture mStrawberry OP9 so that you have confluent layers of mStrawberry OP9 cells for Day 5 of co-culture. Plate mStrawberry OP9 cells at 1x104/cm2 for confluency at Day 5 (as in step 3.2). Be sure to subculture extra cells for Day 8/9, if necessary (as in step 2.2). Count cells using a hemocytometer. Should have 100-150 fold increase in ES cell number from Day 0. Day 5 ASSAYS -Remaining co-culture cells can be used for flow cytometry analysis, cytopreps(30K cells), ChIP assays, etc. Remove differentiation media from flask and save. Wash monolayer 1x with PBS to remove hematopoietic cells in suspension. Do not toss out hematopoietic cells. Add Co-culture differentiation media or PBS to cells. Use a 21-gauge bluntended needle to resuspend cells and to ensure for single cell suspension Count cells using a hemocytometer. 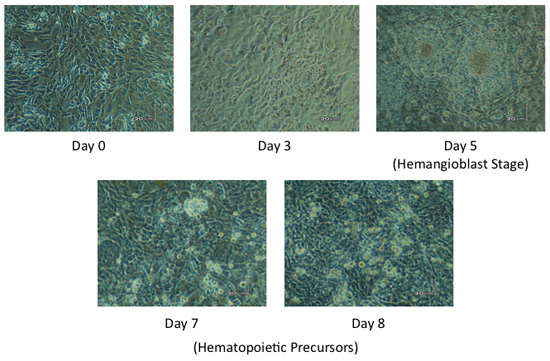 Co-culture can be continued for 14 days to evaluate more mature hematopoietic progenitors by re-seeding co-culture cells onto a new layer of confluent, mStrawberry OP9 cells at Day 8 or 9 and then again on Day 12. Re- seed optimized cell number based on required cell recovery for day of assay. Evaluation of ES-derived progeny (Day 1-14). ES-derived progeny can be evaluated on any day of co-culture by flow sorting out mStrawberry negative cells (ES-derived progeny). ES-derived progeny (mStrawberry negative cells) can be flow sorted from mStrawberry positive OP9 cells. ES-derived progeny can then be characterized by flow cytometry analysis, cytopreps, ChIP assays, etc. Figure 1. ES/mStrawberry OP9 Co-culture System. Our lab uses an in vitro ES cell co-culture system to model hematopoietic development. In this co-culture system, ES cells differentiate, into hemangioblasts at Day5, when placed on a confluent layer of mStrawberry OP9 cells. As the co-culture proceeds, hematopoietic precursors are present at Day 8, while terminally differentiated hematopoietic lineages appear by Day 14. Arrows indicate days of differentiation when passaging of ES-derived progeny onto new confluent layers of mStrawberry OP9 cells in necessary. Figure 2. Proper ES cell Differentiation. ES cells are seeded onto a confluent layer of mStrawberry OP9 at Day 0. ES-derived progeny begin to become visible at Day 3 of differentiation, with ES-derived progeny looking like a cluster of cells with a defined border or beginning to form a whorl pattern. 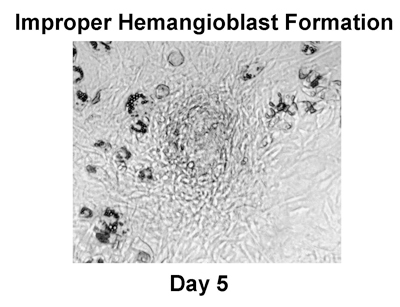 Hemangioblasts, which are the common mesodermal precursor for the endothelial and hematopoietic lineages, should appear as piled up whorls of cells at Day 5. For co-culture periods longer than five days, ES-derived progeny should appear as clusters of hematopoietic cells. Two to four celled clusters, at Day 6/7, should appear and grow into larger cell clusters by Day 8/9 of co-culture. Other ES derived progeny are also found tightly bound to the adherent stromal cell layer. Figure 3. Unsuccessful ES cell differentiation. Results from this co-culture reflect improper ES cell differentiation. Note how the ES-derived progeny do not appear in a whorl pattern at Day 5. The absence of cells in a whorl pattern indicates improper hemangioblast formation. If hemangioblast do not develop properly, then continued co-culture will result in stunted hematopoietic lineage differentiation. Co-cultures with improper hemangioblast formation should be discarded. Figure 4. mStrawberry OP9 cell cultures. (A) mStrawberry OP9 cell are subcultured at 70-90% confluency. (B) For proper differentiation, ES cells and ES-derived progeny are placed onto a overly confluent layer of mStrawberry OP9 cells. Figure 5. Representative ES/mStrawberry OP9 Co-culture flow profile. All ES-derived progeny are mStrawberry negative cells and can be flow sorted from the mStrawberry OP9 cells. mStrawberry negative cell gate was determined using a traditional ES/OP9 co-culture. Proper differentiation of ES cells on confluent layer of mStrawberry OP9 cells results in the production of Flk1+ hemangioblasts at Day 5 of co-culture. Hemangioblasts should appear as piled up whorls of cells, as observed in Figure 1. For the remainder of the co-culture, visible ES-derived progeny should appear as clusters of hematopoietic cells (Figure 1). At Day6/7 two to four cell clusters should appear and grow into larger cell clusters (both adherent and in suspension) by Day 8/9 of co-culture. Other ES derived progeny are also found tightly bound within the adherent stromal cell layer. Although not listed in the protocol, it is critical to pre-test the FBS used in the ES growth medium, the mStrawberry OP9 growth media and the ES/mStrawberry OP9 differentiation media. Properly tested serum should ensure proper growth of mStrawberry OP9 cells, as well as, proper differentiation of ES cells in co-culture until Day 5 of differentiation. As an alternative or in addition to mStrawberry OP9 cells, OP9 cells can be irradiated, at 8000 rads, prior to seeding at confluency (7.8x104 cells/cm2). Irradiation of OP9 cells allows for the elimination of repeated replating steps, as well as, allows for almost complete elimination of old, contaminating OP9 cells from downstream assays. OP9 cells were engineered to express mStrawberry protein by transducing OP9 cells with 3ug/mL of a lentiviral vector expressing mStrawberry under the control of a CMV promoter (pRRLsin-CMV vector, UCLA vector core). Standard ES/OP9 co-culture protocols entail the placement of ES cells onto a confluent layer OP9 cells, as well as, a day 5 replating step in order to reduce old, contaminating OP9 cells from cell passage. Additionally, only hematopoietic cells found in suspension are removed for evaluation of ES-derived progeny. However, with both a replating step and the harvesting of only suspension cells one potentially misses a substantial number of the developing ES-derived hematopoietic cells. This issue becomes important to address when trying to characterize hematopoietic defects associated with knockout ES lines. In order to circumvent this issue our lab used a modified co-culture, through the use of mStrawberry-expressing OP9 cells. This assures that all ES progeny are transferred to the continued co-culture at day 5, and for the harvest of all ES-derived progeny for downstream assays. This modification provides a useful tools in the evaluation and characterization of hematopoietic progeny derived from both human and mouse ES lines. This ES-mStrawberry OP9 co-culture model recapitulates the various stages primitive and definitive hematopoiesis. In studying the earliest stages of hematopoietic development, many people use the BL-CFC(Blast-like colony forming cell) assay, which assess the development of the hemangioblast from the ES cell. While the BL-CFC assay is a useful tool when investigating early hematopoietic development, the mStrawberry-ES co-culture systems exhibits increase utility as it allows for the assessment of hemangioblast, as well as, more adult hematopoietic lineages. Previous work using traditional OP9/ES and EB differentiation protocols has shown that additional factors maybe necessary, such as overexpression of HoxB4, in order to derive long-term repopulating hematopoietic stem cells in vitro. 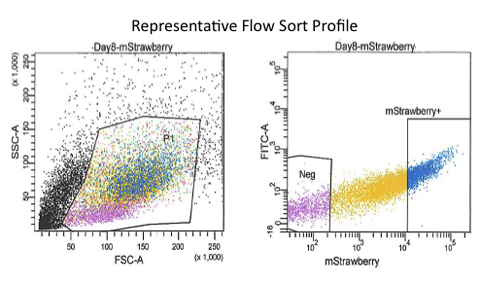 Additional work is necessary to assess whether mStrawberry negative, sorted ES-derived populations contain true hematopoietic stem cells. We thank U. Ganapati for the establishment and testing of the mStrawberry OP9 cell line. Additionally, we thank H. Shafifor her assistance with the co-culture. H.P. is supported by a fellowship from the National Heart, Lung, and Blood Institute (F31HL087714) (H.P.). The content of this work is solely the responsibility of the author and does not necessarily represent the official views of the National Heart, Lung, And Blood Institute or the National Institutes of Health (NIH). The UCLA Flow Cytometry Core Facility is supported by the NIH (CA-16042 and AI-28697), the Jonsson Cancer Center, the UCLA AIDS Institute, and the UCLA School of Medicine. Baron, M. H. Embryonic origins of mammalian hematopoiesis. Exp Hematol. 31, 1160-1160 (2003). Baron, M. H. Early patterning of the mouse embryo: implications for hematopoietic commitment and differentiation. Exp Hematol. 33, 1015-1015 (2005). Baron, M. H., Fraser, S. T. The specification of early hematopoiesis in the mammal. Curr Opin Hematol. 12, 317-317 (2005). Desbaillets, I., Ziegler, U., Groscurth, P., Gassmann, M. Embryoid bodies: an in vitro model of mouse embryogenesis. Exp Physiol. 85, 645-645 (2000). Ganapati, U. Modeling notch signaling in normal and neoplastic hematopoiesis: global gene expression profiling in response to activated notch expression. Stem Cells. 25, 1872-1872 (2007). Hogan, B. Manipulating the mouse embryo : a laboratory manual. 2nd ed, Cold Spring Harbor Laboratory Press. Plainview, N.Y. (1994). Keller, G., Kennedy, M., Papayannopoulou, T., Wiles, M. V. Hematopoietic commitment during embryonic stem cell differentiation in culture. Mol Cell Biol. 13, 473-473 (1993). Keller, G. M. In vitro differentiation of embryonic stem cells. Curr Opin Cell Biol. 7, (1995). Nakano, T. Lymphohematopoietic development from embryonic stem cells in vitro. Semin Immunol. 7, 862-862 (1995). Nakano, T. In vitro development of hematopoietic system from mouse embryonic stem cells: a new approach for embryonic hematopoiesis. Int J Hematol. 65, 1-1 (1996). Nakano, T., Kodama, H., Honjo, T. Generation of lymphohematopoietic cells from embryonic stem cells in culture. Science. 265, 1098-1098 (1994). Turksen, K. Embryonic stem cells : methods and protocols. Humana Press. Totowa, N.J. (2002). my question..what is the different between the op9 media and differentiation media? Potentially the serum. Serum needs to be tested for proper OP9, ES cell, can co-culture growth. Serums used for OP9 cell maintenance is not always appropriate for ES cell differentiation. Would you mind please tell me how to prevent OP9 cells from differentiating into adipocyte in the co-cultures? The OP9s should differentiate in the co-cultures. This ensures good ES cell differentiation. Beautiful studies! I would like to ask if we can obtain mStrawberry/Op9 cells from you. If you have, we also like to obtain OP9-DL1 cell line. m-Strawberry mutant fluorescent protein derived from DsRed, using a third-generation self-inactivating lentivirus. Also, we do not have OP9 DL1 cells. I would like to kindly ask you for a piece of advice. I've been trying to coculture embryonic stem cells with the OP9 feeders, but I noticed that the ESCs don't adhere, and even at day 5 I couldn't notice any colonies. The OP9 cells that I used were 80% confluent, and I followed exactly the protocol that you described. Did you happend to experience this problem, or do you know any reasons why this could oocur? What type of ES cells are you using, mouse or human? Also, if you look back at the protocol, the OP9 cell layer needs to be 100% confluent before plating the ES cells on top of them. Almost to the point of being overgrown I would say works the best. Try that and see if that helps. Hello, I'm trying to differentiate induced pluripotent stem cells in T cells and the middle point consists in the generation of hematopoietic progenitors, using your protocol, followed by the transfer on OP9-DL1 feeder cells in the presence of IL2. However, the yield of differentiated colonies is very low, and the iPSCs maintain their morphology. Do you have any recommendations on how to improve the protocol? Thanks a lot. Would it also be possible to have the recipe for the differentiation medium, please? The recipe for differentiatiom medium is in the protocol. The FBS should be tested out to at least Day5 in a co-culture Choose a batch of serum that gives the correct differentiation and cell growth. We have never used iPSCs or grown the co-cultures with IL-2, so this problem may be something particular to your ES cells or something else. How many days did you let your co-cultures grow ? We have never tried to differentiate iPS cells using this protocol so not sure how well the cells differentiate. Are you saying that you the iPS cells do not differentiate into hemangioblasts? There are studies showing that iPSCs also differentiate into hemangioblasts. I started working on in vitro differentiation of iPSCs 4 months ago, and so far I didn't have positive results with my cells. However, I've been using the FBS that we normally have for cell culture in the lab, maybe I should try different companies. Thanks a lot for your quick reply.